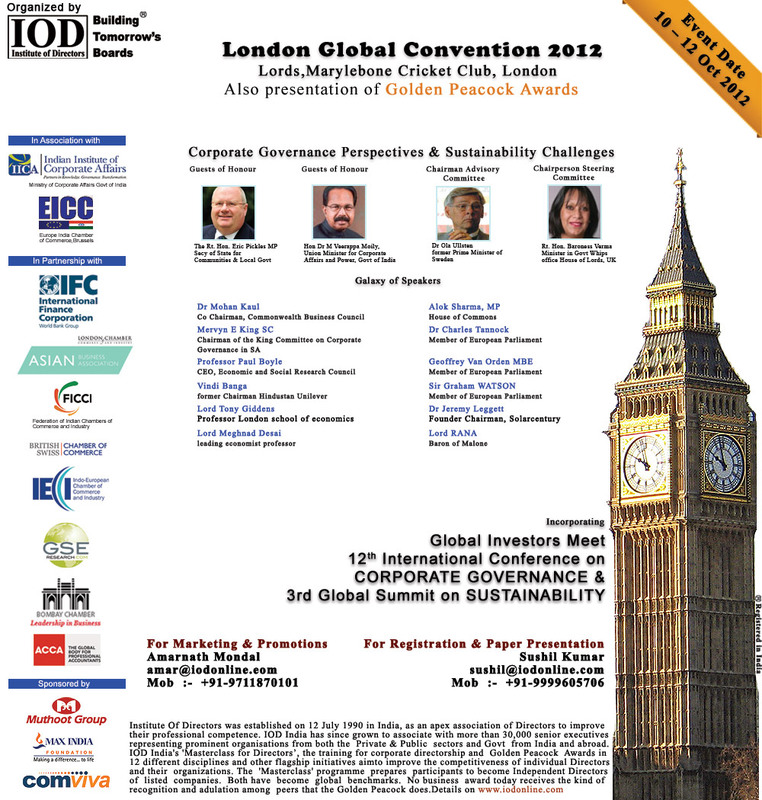 Chamber joined IOD India for the London Global Convention 2012 Incorporating 12th International Conference on Corporate Governance & 3rd Global Summit on Sustainability. EICC, as Europe’s Apex trade and business body accepted an invitation from the Institute of Directors, India to join as Associate Partner for the Global Convention 2012 to be held in London on 10 -12 October 2012. The theme of the Convention was Corporate Governance Perspectives & Sustainability Challenges. Institute of Directors was established on 13 July 1990 in India, as an apex association of Directors to improve their professional competence. IOD India since has grown to associate with more than 30,000 senior executives representing prominent organisations from both the Private & Public and Govt worldwide. The IOD India’s activities extend from training, monthly lectures to workshops, national and international Conferences on issues such as Quality, Environment, Climate Change, Occupational Health and Safety, Corporate Governance, Cyber Security, Competition Law, Sustainability and Corporate Social Responsibility, held in India and abroad. The Convention was organized by the Institute of Directors, India in partnership with Federation of Indian Chambers of Commerce and Industry (FICCI) and Associated Chambers of Commerce and Industry of India (ASSOCHAM) and a number of other national and international organizations. The Convention began with Global Business Meet on 10th Oct 2012, which offered businesses trade and investment scenarios apart from new market development, economic research and technology & outsourcing consulting paving the way for new joint ventures and collaborations. This event also incorporated the 12th International Conference on Corporate Governance, 3rd Global Summit on Sustainability and the presentation of famed Golden Peacock Global Awards during the Convention. A large number of experts, professionals, opinion and business leaders from all over the world attended this event. This was the biggest gathering of business leaders, corporates, industrialists, policy makers, ministers, parliamentarians, jurists, NGOs, administrative officers, Academicians & University Students from across the global boundaries. The event was led by Hon’ble Dr. Ola Ullsten, former Prime Minister of Sweden who was the Chairman of Advisory Board. EICC actively supported the Convention through its network with wide publicity and participation, and signed a MOU with the IOD India.